Keith Dalgleish was one of the best apprentices the country had seen for many years. Stable jockey to Mark Johnston, Dalgleish notched up nearly 300 winners, including a £70,000 Group 1 in Germany aboard ‘Yavana’s Pace’. Naturally, at 6ft tall it was a daily struggle to maintain the required weight. At just 21 he had no choice but to retire, the only sensible option, or in his words another season juggling his weight would send him “potty”. 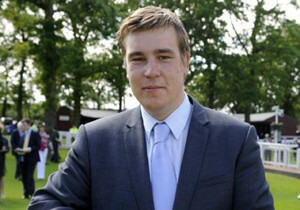 Keith joined Belstane Stables in January 2011, and in August 2012 the yards owner, Gordon McDowell handed Keith an opportunity which was too good to turn down – He took over the yard, which is now the home of Keith Dalgleish Racing. Now in his seventh season as a trainer Keith and his team have achieved over 360 winners to-date. A shrewd, workaholic trainer, Keith delivers a constant stream of winners and is clearly one of the best young trainers in the country. We are delighted to offer our first horses with Keith. Zoravan is a winner of 1 race from 6 starts and has an official rating of 77. Both Keith and Ontoawinner are very confident he will add to this tally in the near future. Zoravan is ready to run and has an entry at Southwell next Tuesday so he will be hitting the racecourse in the yellow and whites soon. He will be campaigned on both the all-weather and the turf in the coming season. He adds quality to the string and will be running regularly this year. He is a big strapping horse and we are confident he will deliver wins this year and is more than capable of improving his rating of 77. If you are looking to dip your toe into racehorse ownership and are looking for a future winner with lots of fun days out at as reasonable price, Zoravan is the horse for you. He will sell quickly, a 5% share is priced at £780 upfront then £130 per month for training fees. This Colt is very forward and has already worked several times up our grass gallop. He’s as tough as nails and looks very sharp. I fully expect this 2 year old Colt to be running early in the new flat season and I’m confident he has the ability to win at 2. Pastoral Pursuits raced at 2, 3 and 4 years old winning a total of 6 out of his 10 career starts beating Hong Kong Mile (Gr.1) winner Firebreak and Prix De LAbbey (Gr.1 ) winner Avonbridge along the way. He won at Group level every season he raced; was a July Cup (Gr.1) winner, a track record breaker at 2YO and was the Top- Rated Sprinter in the UK & Europe in 2005. Just like his sire Bahamian Bounty, it is Pastoral Pursuits juveniles who have been flying the flag at the highest level. Pastoral Pursuits is proving that whether you want an early two year old type on the track, or a fantastic return in the sales ring, he will consistently get you the results that you need. His Dam (Justbetweenfriends) has produced 4 winners from 7 runners. Our own Flying Pursuit is another son of Pastoral Pursuits, a family that we are very familiar with. Both Keith and Ontoawinner are very excited about this colt and feel he will win at 2. He will sell quickly, a 5% share is priced at £900 upfront then £130 per month for training fees.